Q: Coach Tony Samuel… how would you describe him? TA: I think what made him special was the fact that he played the game and it was his credibility from that perspective, he started as an outside linebacker and we knew he’d been through the wars. And probably the thing he’d benefited from was -because he understood the wars and the culture- he knew exactly what we were going through: what it was like at the end of the day, as a freshman or as a senior, the responsibility that position entailed. I think he understood people, and his great gift was having a great ability to read people, to understand what motivated them. Some kids needed more, some needed less. Some needed a pat on the back and some needed yelled at. He never treated every single guy the same. He had that ability to assess what our needs were and he tried to fill those. Q: What would you say your need was? TA: I was probably more the guy who needed to be encouraged. I didn’t need to be yelled at, I needed to be coached. I was going to give you all of my effort that I had. If I made a mistake it was not because of effort, it was generally because I didn’t know what I was doing or was confused. He simply taught me, he coached me, he did what he was supposed to do. He didn’t yell and scream and try to protect himself from the defensive coordinator or the head coach. He had a very, very effective style and I would have run through a wall for him. Q: What about Coach McBride? TA: Different style. Of course, he coached the defensive line, so my interaction with him was less. But no less the same: a motivator, a tough guy, he would tear your heart out but be the first guy there if you ever had a need. There was never any misunderstanding that he didn’t care for you, because you always knew he did. He was also the Defensive Coordinator, so he had a different role. There had to be little bit different style, you can’t have everybody on the staff being your buddy. You needed some enforcers. He was a general, a guy that would command action out of you, but he would also get down in the trenches with you and go to battle with you, so I have a great, great deal of respect for that man. Q: In one sense, was Charlie maybe the alter ego of Coach Osborne? TA: I think a little bit, I think you better have a Defensive Coordinator that engenders aggressiveness. I can’t imagine a passive personality in that role playing real well. I just think it was a really nice balance, a nice chemistry on the staff. Coach Osborne understood when building the staff that it didn’t make a lot of sense to have the same personality, you know? We were the Blackshirts, we were the aggressors; it would only make sense the leader of the Blackshirts be a little of a Blackshirt himself. Q: What can you tell me about the feedback, the grading process, the film study? TA: A good coach understands that during the week is a time to teach and coach, during the week is a time to get after people. The game is a game. During the game is not a time to embarrass a player, not the time to single out a player, not the time to have the player completely walking on eggshells because he’s concerned about making a mistake. Game time is about time to play, time to release, time to play with energy, you know what I’m saying? Play with freedom. I think our coaches did a great job of that. Coach Osborne had no tolerance for coaches who undressed players on the sideline. I’m not saying that a coach didn’t get after you (I had my fair share of Charlie McBride grabbing my facemask and chewing tobacco spit in my face as he was yelling at me) (laughs) but I was a young player and they were mental mistakes, mental-type things. I think they did a great of job of teaching during the week and then just letting us perform during the games. Q: Somebody said that January of ’91 was a major turning point leading into the success of your senior year, where all of the guys stopped making excuses and really dedicated themselves to the program. Do you remember that? TA: I do. And I think the reality was that we weren’t a very good football team, we weren’t a very tough football team. I always thought about being a champion: First, you have to have the courage to win. Second, then you have to have the talent to win. And part of having the courage to win was being willing to pay the price. I will tell you -early in my career?- that we didn’t have the courage to win. I think we were pretty good, we were alright. We won 9 games but we didn’t have the courage to win, we didn’t pay the price to win. But then as my career progressed I believe that we finally -come my senior year- had the courage to win. But I think we were still missing some players as far as the talent. But then that next year some of that talent started to grow up and show up, we were beginning to turn the corner. But certainly early in my career I don’t believe the football team wanted it enough. I say this tentatively, because I respect deeply the leaders that came before me: I think there was great leadership, individually, on those teams when I was a young player. There were guys like Pat Tyrance, great individual leaders, but as a whole the leadership wasn’t where it needed to be, nor was the courage to win. Q: How was that courage then developed? TA: I just think there was a determination and desire to say “enough is enough.” Part of it was that meeting, part of it was that message, part of it was, “enough of this nonsense,” you know? We got embarrassed in the Citrus Bowl against Georgia Tech, we got embarrassed in bowl games. It was just getting tiring being embarrassed against top competition. We beat all the teams were supposed to beat, like Missouri and Iowa State and Kansas and Kansas State. We beat all of them but no one cared about that. We were relevant locally, we weren’t relevant nationally. I think there was a concerted effort from everybody. There was the strength staff, the athletic staff, the trainers. We needed to turn the corner and do what we needed to do to win. Everybody was encouraged to go the extra mile, and it was a concerted effort from the top. And we paid a bigger price. Q: In what ways would you quantify that price being paid? TA: I think unity was very important. I think Dr. Jack Stark had something to do with that, the Unity Council, better communication from the coaching staff about, “This is your team, not ours. Seniors need to step up.” There was better leadership, guys were more committed. Guys quit going out and drinking Wednesday and Thursday nights. I think when I was a young player some of the older kids I knew were out downtown, they weren’t as committed as they needed to be. They weren’t as committed in bowl games. The advantage, the sad fact was that we were Nebraska and we were going to win games, but then something changed. I certainly think there were a lot of people in the program who just got tired, were the kind of people who, when challenged, weren’t going to go cower in the corner and give up. We were the kind of people who say, ”Alright, enough of this crap. Were gonna find a way,” and we found a way to out-work people. And I think the coaching staff went to more speed and started putting it on the field. They realized having speed was very important. My junior year we went through a stretch where we played Colorado at home and they were ranked highly, and we beat them 52-7. And the next week we played Kansas. They were a top 10 team and we blew them out, too. We largely played nickel the entire game, so we played a 4-3 defense with the outside linebackers with a hand down -235 lb. guys with speed- and think they realized that speed kills. And they studied Florida State a little bit more and what they were doing, and made changes schematically, as well. Q: You were at the next year’s National Championship game on the sidelines, right? TA: I was standing there with Doak! I just remember this team having the courage, having paid a bigger price than us. I felt good about that fact. It wasn’t just me, but my class. I felt our class positioned the future, as being good stewards of Nebraska football. If you approach it that way, the class after us was positioned for success, we taught them how to work. Their leadership built off of ours. They had the courage to win, but I think some of that talent was beginning to mature, and they were pretty good, man. I just remember going into the locker room after the game to congratulate Coach Osborne and I remember him saying that he wished I have won the championship, that our class deserved it. And I thought that was pretty telling. Once again, it was his humility. It wasn’t about him, it was about the program and how he cared about his players. That was pretty cool. 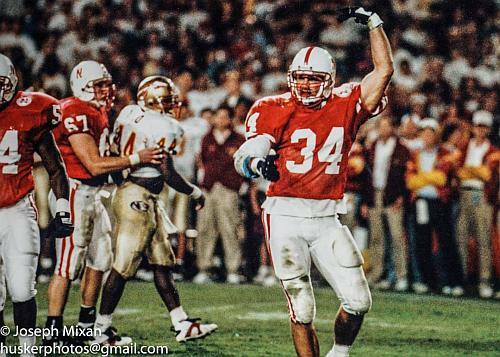 Q: From your last game as a Husker, that 18-16 Florida State game, what stands out to you? TA: Well, just the back and forth, playing against Charlie Ward. I respected him greatly. I thought he was a warrior, thought he played with a champion’s heart. Q: Were you spent by that time? TA: I didn’t have anything left. The only consolation I felt was in walking back subsequent to the game, I didn’t have anything left. 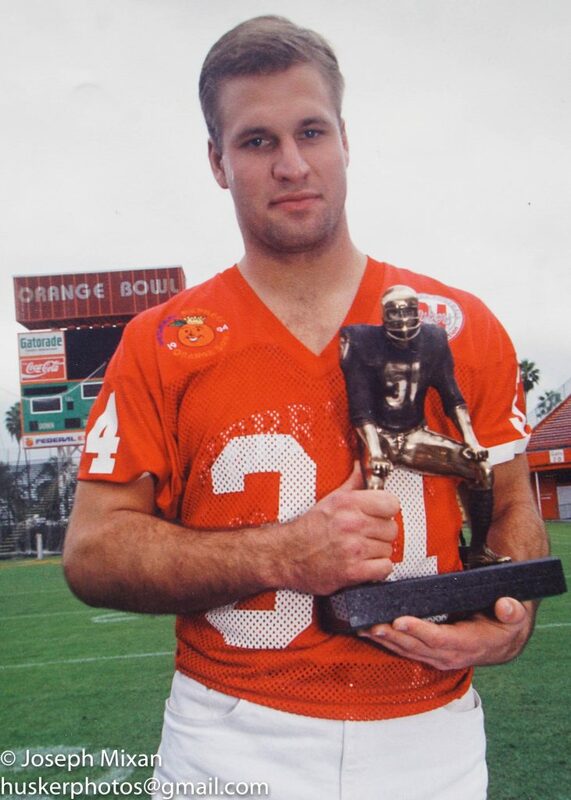 I probably could have been in a bit better shape, I went on a tour -you know, with academics and the Butkus Awards and All-American stuff- but I didn’t have anything left. I literally was emotionally, physically -and I’d even say spiritually- I was spent. I didn’t have anything left. I gave it everything I had. It wasn’t enough. But Coach Osborne told us that we played like champions. And that was the thing that was important. I put some solace in that. Q: You essentially played with only one arm in that game, didn’t you? TA: Well, a lot has been made of that. I had two arms and I had a functioning right elbow. I wouldn’t say it was quite as strong. I wouldn’t say it held me back. I watched the film maybe once or twice after that game and there was probably 3 more plays that I left out there on the field, three more sacks that I should have had. But I can’t say that I’m some sort of hero because I played with one arm. I was able to do all I could do. Q: So your rookie year you’re in Indianapolis with the Colts the whole time. Was that Miami U. game then the first time you’d seen the ’94 team live all year? TA: Yeah, I came back for that Orange Bowl game. Q: Did you sense a change in the vibe at all? TA: A sense of urgency. I could sense it was a team that was destined to win, and I just remember looking at the offensive line and thinking I was glad I didn’t have to play against them every week. I remember it was just the focus. I remember during the week Miami had a few things to say, and I could see a football team motivated to get the win for Coach Osborne. Q: Any other memorable games stand out to you from those playing days? TA: I always enjoyed playing against Iowa State because I was from there, other than the fact that we lost to Iowa State in Ames. That was pretty embarrassing. They deserved a lot of credit, with a 3rd string quarterback in Marv Seiler. They switched to the option -the same option we’d been playing against for 20 years- and we just couldn’t stop them. I remember that game, but you know, not any others in particular. Every game was an incredible environment full of fans who were passionate. Every game was just a pleasure, a joy, a privilege. I know a lot of guys wait until after they’re done to realize it, but I knew that I was pretty privileged to get to play there. I knew that.